Once upon a time, a beautiful little Purebred Arabian filly was born. 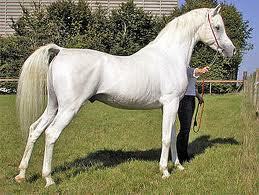 She was crystal white with pure black mane and tail. She has no markings and ice blue eyes.Her mother was a palomino named Gold and she decided to call the filly, Ivory. Gold new Ivory would be a great horse one day. As the days and months went by, Ivory was growing more beautiful every day. Every stallion or colt in the land wanted her for their own but she always refused them. Her mother and father said "Ivory,you must be choosing a stallion soon or your gone." Ivory looked at her parents shocked then said, "well, I guess I'll be going." Ivory took off at breakneck speed as hot and steamy tears run down her face.She stopped later on and then stood.She stood half the night not even eating or drinking even though she was dying of thirst. She lied down and rested then fell asleep. Later on, she was awakened by a loud crunching noise. She suddenly jumped up and perked her ears and looked down the bushes and flared her nostrils. She stood then looked squinting as a pure white stallion stepped out from behind the bush and looked at her with forest green and gold eyes. Ivory was hypnotized by them and took a few steps forward. She then gently touched noses with him. "Hello." 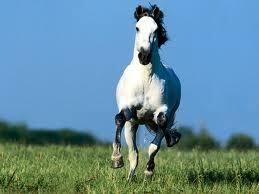 Said the stallion in a deep but gentle voice.Ivory said hello back sweetly. He then smiled and gently nudged her and said "I'm Phantom....wait can you see me?" He said and Ivory said "yea, why? And I'm Ivory." Phantom began jumping around smiling and said "your the first to see me!" Ivory looked at him and then looked into his eyes and said "really? You're the first to sweep me off my feet." Phantom blushed at this then stood and then said "okay, so, your my mare." Ivory looked at him and then said "okay." She was truly lovestruck by him. He stood and smiled and then galloped off with him into the sunset. Ivory and Phantom now had a large herd and 2 foals named Arabella and Thunder. They were going to have another one soon. Her mother and father were so proud of her and happy. They lived happily ever after. IVORY IS THE WHITE HORSE WITH THE BLACK MANE AND TAIL AND PHANTOM IS THE PURE WHITE ONE IN THE PICS ABOVE.